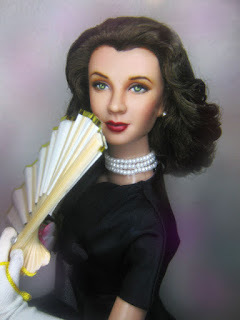 Scarlett Reverie: Ashton Drake Inspiration: Tonner Scarlett wears "Love after the Hours"
Ashton Drake Inspiration: Tonner Scarlett wears "Love after the Hours"
A Tonner Scarlett repainted now as Vivien Leigh peeps behind her fan. It is not difficult to fall in love with Ashton Drake's creations for their Gene doll. Gene after all boasts of a fairy-tale-hollywood character, adorned with lavish hairstyles -- and befitting her character, amazing tailoring for her clothes. "Love After the Hours" is one of them. It is a classic 1957 style dress of black silk (I was wishing they used something softer to capture the swirl). The brochure that comes with this describes the dress to be made with "superb tailoring" and it is true. The dress is cut vertically on the skirt to capture a fullness that accentuates the waist of the doll. 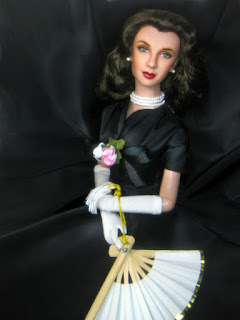 The skirt billows just above the ankles to reveal black 50s inspired shoes (designed with "left" and "right" appropriateness for the doll's foot. It fits perfectly on the Tonner doll's feet. An underlayer of crinoline serves to add fullness to the skirt of the doll -- which is actually not needed as the silk is not that soft and holds the skirt well. Charming accessories: a painted fan, silk flowers, earrings, elegant evening gloves and hose. This ensemble is designed by New York fashion artist Tim Kennedy. For the repaint. I wanted to capture Vivien Leigh's hairstyle in "Waterloo Bridge". 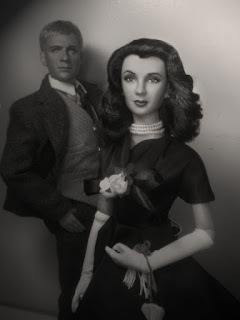 The Tonner Scarlett though is blessed with abundant hair which is quite hard to flatten at the top similar to Vivien Leigh's. The swirl at the side of the head was done with hairspray and held by soft rubber bands. Voila! The Vivien Leigh swirl -- or at least in my eyes. Herein are photos that marry the "dream" behind AD's Gene, and Tonner's "The Power of Play". Enjoy the portraits. I couldn't put in too much -- maybe soon. Fantastic Boots! She is Viv for sure. 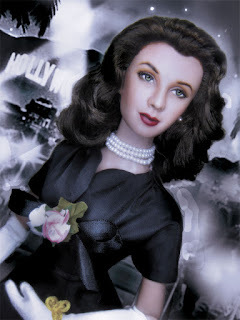 Which Tonner Scarlett was she? The hair color looks jusst right, (unless you've photoshopped it). 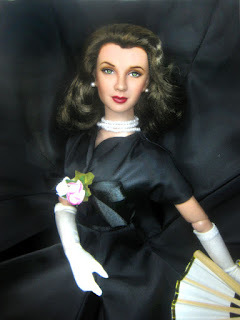 The Tonner I have, her hair is too dark. Hi Nikki! Thank you so much! I was actually inspired by a post you did on vintage hairstyle. 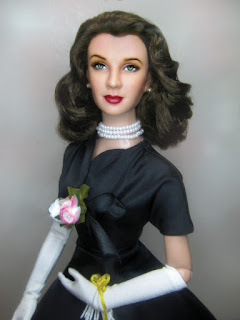 This doll reminds me of you actually and your love for vintage hairstyles and clothing. She's a basic Scarlett. The hair is dark brown, I just photoshopped (dodged) a bit to release the highlights. = ) Thank you for dropping by.